The Apple Watch is the most popular smartwatch in the world by a wide margin, but it doesn’t even hold a candle to the Amazfit Bip Smartwatch by Huami when it comes to one important feature: battery life. You’re lucky if you can squeeze two full days out of a charge on the Apple Watch, which is why it’s so important to carry a portable Apple Watch charger like this one. 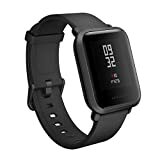 Meanwhile, the Amazfit Bip features notifications support, GPS, constant heart rate monitoring, and even sleep tracking, and yet it lasts for between one month and 45 days on a single charge! The Bip’s $100 retail price is an absolute bargain, but it’s back down to just $65 right now on Amazon. Definitely check it out.